Collins Booksellers - 21 Productivity Hacks for Home Based Business Owners: How to Be Productive as a Home Based Business Owner by BJ Min, 9781516361908. Buy this book online. 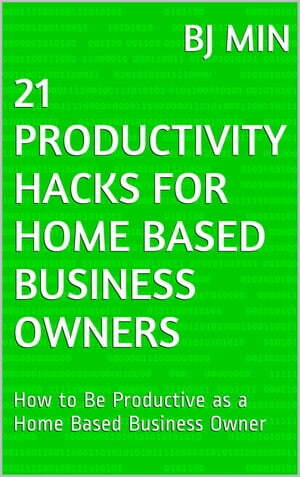 If you are a home based business owner and you want to be MORE productive to get MORE results in your business, then get "21 Productivity Hacks for Home Based Business Owners" by BJ Min. BJ Min is a bestselling author of the book "How to Make Money with Ebooks" and has been a fulltime home based business owner ever since 2008! This is not some book written from research but it is REAL LIFE LESSONS by a REAL HOME BASED BUSINESS OWNER since 2008! BJ Min went from being a once broke convenience store clerk to eventually earning over a MILLION DOLLARS in sales online in his internet marketing careerr through his own home based business. He shares his TOP 21 real life lessons on how to be productive and stay focused while having your own home based business. - Discover the ONE BIG THING that can produce the biggest results for your business! - The best FREE countdown timer that BJ recommends you to use to get MORE work done in less time! - How to create a routine so you get PRODUCTIVE WORK done every single day. - The BEST places to work outside your home to get MORE work done! - A FREE place that you can go work that you may have overlooked for all these years that can greatly help you get MORE work done in less time. - How and where to hire a virtual assistant the right way so you can get more work done in a faster and more efficient way. - Stop getting overwhelmed and distracted by email so you can get MORE time to do what grows your business! - How to no longer get sucked into looking at what other people are doing and stay focused on your OWN vision at all times! - Why you must work out physically to produce MORE results in your own business.